Corporate holiday gift for a yummy thank you. Hostess gift, secret Santa , or teacher gift. Yummy at its best. Gourmet brownies. 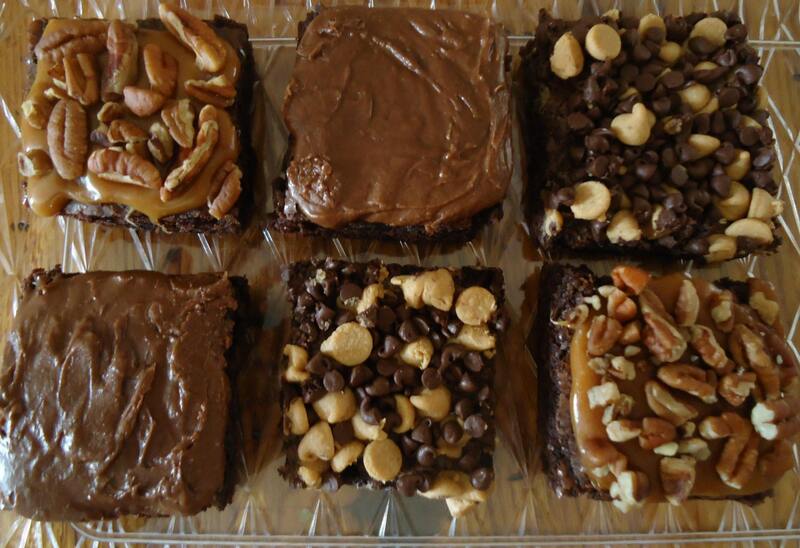 A six pack of delicious brownies: Two each of Carmelious, Chocolate paradise, Old fashion fudge brownie. A true taste bud sensation . You will make all the BROWNIE POINTS with this crave-able sensation. This would make the perfect treat for someone special on your list who has it all. Birthday, holiday, corporate thank you, summer vacation, its Monday, or just because are all great reasons to enjoy these customer favorites. Old Fashioned Brownie-Sweet memories of Nana house with be evoked upon enjoy this decadant treasure. Rich chocolate brownie with a yummy chocolate drizzle. Chocolate Paradise-Rich chewy chocolate brownie, topped with a combination layer of peanut butter, chocolate chips and peanut butter chips. This is a truly chocolate lover's paradise. Made to order with the freshest ingredients. Individually wrapped and ready to delight. Someone one must be available to receive package immediately due to HOT weather and melting issues. - My husband thought these gourmet brownies were absolutely delicious! -Delicious Brownies, great communication, and speedy shipping. These made a great Valentine's present. Thank you! - Amazing brownies - love this etsy shop. So wonderful to work with! -Simply delicious are these brownies!!! ... just ask my son! Thanks so much! Very good brownies! I recommend trying these! The best I have had from on line, many are just walnut extract not much nuts, But this was full of walnuts and nice and heavy. Was a little dry but didnt bother me, Maybe next one be be fresher., I ordered with out icing as I like the cake with out the extra sugar. Very moist and very good flavor. Thank you! Another fast shipment. Thank you so much for getting these loafies out so quickly and in time for Easter. Know my sister and her husband will enjoy these delectable little cakes. Love anything coconut myself, so I am pretty sure they do too. We accept paypal (American Express, Mastercard, Visa and Discover) , and etsy direct payment. We ship orders within 3-5 business days of receiving a processed payment. Baked goods ship on Monday, Tuesday, and Wednesday (to ensure your items arrive fresh). Shipping time change during the holidays due to Carrier volumes. We ship using only Priority Mail, which takes 2-3 days for delivery once shipping begins. Every order is wrapped and ready for gift-giving! We can include a personal note to your gift recipient, just leave us instructions at checkout and we would be happy to include your special message. We can customize or personalize for your special event.